The Project B-25 Mitchell is supported by the King Baudouin Fondation*. All payments higher than 40 euros allow to enjoy of a tax deduction. *(copy-paste Belgian Aviation Preservation Association in the search field). Years ago, a North American B-25J "Mitchell" has been acquired to be preserved in Belgium. With your help, this airplane will be restored and displayed in Belgium as a memorial to those many Belgians who fought in the B-25 which equipped the 98, 180 and 320 Squadrons during WWII. Some 15.000 Euro have been raised to acquire and transport the aircraft. This was achieved thanks to the dedication, enthusiasm, creativity and competence of volunteers and professionals. Today you have the opportunity to take an active part in this unique adventure by helping restoring this airplane to a high standard. The first step was to find an available B-25 that could be acquired for a reasonable price and would be in reasonable condition for a static restoration. This B-25 is a Movie Star. It flew in movie Catch-22 as "Laden Maiden" in 1968-1969. Later on in 1978 it flew in "Hannover Street" as 151632 "Gorgeous George-Ann" and later "Thar She Blows". Peter Arnold kindly sent us a few pictures taken in May 1978 at RAF Bovingdon. He was at the Hanover Street filming ..... and almost flying: they caught fire on the take off run in 'Brenda's Boy'! 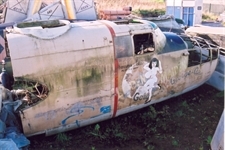 After this last film, it was stored, changed hands several times and was stored at various locations like Coventry Airport where it was parked at a place called 'Rock Farm'. It finished in a dismantled condition at Sandtoft. There its condition, slowly but certainly, deteriorated. 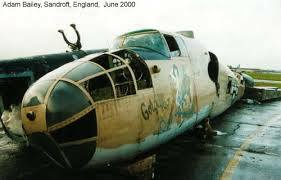 In December 2004, one of our members discovered in "Flypast" news, that a B-25 stored near Hull was on sales after demise of the Imperial Aviation Group. A small project team was created and studied the possibility to raise funds for the project to buy and convoy the aircraft to Belgium. Just before the New Year 2005-2006, the Brussels Air Museum Fund gave her formal approval to house the administrative and financial aspects of the project. A bid was placed, which was accepted. As offered, the B25 was in a dismantled state, missing its engines and the gun turret, but in quite fair condition. We later discovered that the plane was not in the expected location, stored in the open and damaged by a shift in poor condition. Last but not least, many components of the plane were scattered around the storage yard and some components were missing. As soon as the payment of the plane had been completed, an emergency transport was scheduled to secure all the small components lying around in the yard. For this first transport, we borrowed the van of “Literie Libau”… the custom officer was a bit surprised when he verified the load on our return trip! Thanks to some good contact we have in the transport field, we moved the plane to Belgium in a temporary storage location. NewICC, a company specialized in corrosion treatment, accepted to help us. Complete components, like the fuselage, were treated at very competitive price, saving thousands of man-hours on the project. Before this, the various components needed to be prepared. This preparation included: the manufacture of all the necessary jigs to move and work on the components without damage, the removal of all the equipment to allow a complete access to the airframe. This preparation work was accomplished in difficult condition, as the storage facility offered the minimum of light, electricity, hauling equipment and wasn’t heated. Tools had to be brought each time a “working session” was organized and most of the work was done “by hand”. NewIcc went bankrupt, and finally only small components, like the fuselage floors, hatches and the like, had been treated. Because of this, the B-25 left the premises of NewIcc for Melles, where the main components have been sandblasted by a specialized company. Volunteers worked two complete week-ends at Melles to clean the sandblasted components before a protective coat could be applied. Volunteers worked in "arctic" condition to finish the job. The sandblasting and primer application completed, the B-25 was then moved to Grimbergen in April, 2010 to be stored before further restoration. Restoration work has been slow due to several reasons, the main one being the lack of an adequate workshop to work on the project.